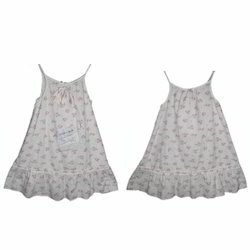 As per the needs and requirements of our clients, we are involved in providing Kids Fancy Frock. We have gained a remarkable position in the market that is involved in offering Kids Party Frock. - Fabric: Premium quality net fabric, which ensures comfort for all day long. Zipper closure and net sash tie for fuss free, easy dressing. - It has multilayer satin, net and cotton lining and its non-pricky.